Do you have troubles winding down at night, calming your mind, or allowing your physical body to relax and ease into sleep? Do you feel you are not getting enough high quality and deep sleep? Sleep is one of the most important parts of health. This is when your body and mind detoxify, which means a lot of restoration and healing is taking place while you are sleeping. But many people today unfortunately struggle with sleep whether falling asleep, staying asleep, entering into deep REM cycles, not feeling rested upon waking, or not dreaming. Below are 12 best practices below to help you fall asleep faster and experience deep, quality sleep to feel rejuvenated upon waking. We eat to be energized and have fuel for future demands we place on our body and brain. Eating close to bed time activates your digestive system and often even if you do fall asleep you are not experiencing high quality sleep. Also, your last meal of the day should be a low protein meal. This signals to the body that you are winding down. Reishi signifies longevity and spirituality and has been used in traditional Chinese medicine for over 2,000 years. This edible medicinal mushroom, often referred to as the king of mushrooms, helps the body and mind relax. It helps to soothe nerves and stimulate sleep cycles, so it is a great medicinal mushroom for easing stress and experiencing quality sleep. Blue light disrupts your natural circadian rhythm by tricking your body it is daytime and therefore minimizing the production of melatonin to help get your body ready for sleep. This minimizes psychological stimulation as well that can get your brain going late in the evening. How to decrease your blue light exposure? 5. Sleep In A Pitch-Black Room. Block all the light sources you can, cover LEDs with black electrical tape (blue light exposure), and wear an eye mask. Yes other people you live with may think you are crazy, but that is a good thing, you doing this is only helping to optimize your health performance. You want to make your sleeping space dark so you put your body and mind in a supportive sleeping environment. Whether that means coffee, tea, chocolate, or matcha. After 11:00pm the body naturally creates a cortisol surge to help keep you awake. Cortisol is our stress hormone, so it puts your body and mind in a state of activity, also known as the fight or flight response. When this happens you may feel that your mind just won't stop, you are restless, you are lying in bed wide-eyed even though you know you were tired, you get angry, irritable, or emotional because you now cannot sleep. Deep breathing is a simple exercise that you can do anywhere to help calm your body and mind. Most people live life breathing in the chest, instead of their belly. Chest breathing restricts the individual from using breath as a way to calm, cleanse, and gain clarity. The calming properties of lavender essential oil help to create a serene environment that is optimal for sleep. Add a few drops of Lavender to your pillows or bedding so that you inhale the aroma as you are drifting off to sleep. Apply Lavender oil to the bottoms of your feet as a part of a relaxing bedtime ritual. Add 2 drops to your diffuser in the evening leading up to bed time. Modern day food from conventional agriculture sources is depleted in the very diversity and levels of nutrients that our bodies need because the crops are also deficient in these very nutrients. This is a result of the life in the soil being very low or not present in these farming systems from the use of pesticides, herbicides, synthetic fertilizers, over tilling and high mechinery. Consequently, the magnesium content in foods is lower compared to pre-industrial times. Magnesium is well known for its ability to relieve insomnia (1) as it stimulates Gamma-aminobutyric acid (GABA) (2) and melatonin release, which helps you fall asleep faster, reach deeper phases of sleep, and wake up less at night. It also helps to decrease cortisol, the “stress hormone,” which keeps you up at night. Magnesium further promotes muscle relaxation providing a calm feeling within the body and helps relieve constipation due to this relaxation in the body and by drawing water in the stools making the easier to eliminate. 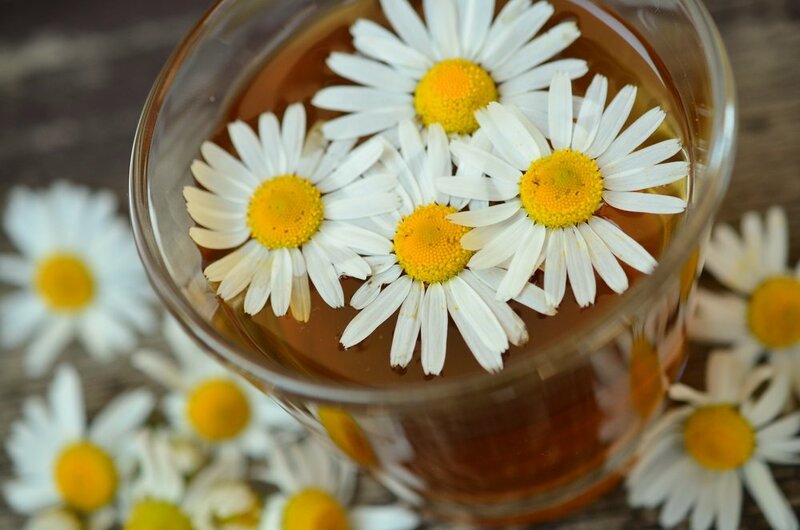 Chamomile is an ancient medicinal herb that has been used in a variety of ways to help soothe and support many health issues as well as relax the nervous system to ease into better sleep. The oil of the Chamomile plant contains a potent source of antioxidants, including flavonoids and terpenoids, helping to enhance immune function, improve gut health, decrease anxiety, increase skin health, lower inflammation, and fight off free radicals (3). Kava tea is a super powerful plant and can be even more powerful than Chamomile for good sleep. Kava is a plant from the pepper family with origins in the South Pacific Islands. It is the root of the kava plant that has been used traditionally to calm the body and mind and encourage deep sleep. The medicinal compounds in kava, kavalactones help to increase both GABA and serotonin, two neurotransmitters that prepare your body for sleep. It is best to enjoy kava tea 1 hour before bed with a fat source, like coconut milk, since the kavalactones are fat-soluble. *Consuming kava root in excessive amounts it can lead to liver damage. Here is a great resource to refer to if interested in learning more about kava and its health benefits. An evening routine is something you do every night helping to train your body and mind that you are getting ready for sleep. This is one of the most powerful choices you can make to help your sleep quality, so you have prepared yourself for the day ahead be doing the tasks you must do before being to fully relax and have also prepared yourself for winding down the day. Are you ready to truly restore your inner and outer ecology for health and resiliency? If the answer is heck YES, I would love to connect with you. You can book your FREE Strategy Call by clicking the image below. As a leading holistic wellness expert and permaculture practitioner, Breanne helps resilient-driven leaders, entrepreneurs, and change-makers optimize their health through nutrition, gut health and lifestyle strategies that are aligned with nature, so they can be their best selves. Read her inspiring story, “From Peachland Queen to military officer to a worldwide permaculture exploration” that lead her to where she is today.